The Cullasaja gorge is a wonderful place to visit in North Carolina. US 64 is a narrow and winding two lane road that may be treacherous. However, as you drive through it, there are small areas to pull over to relax and enjoy the sights and sounds of the Cullasaja River. 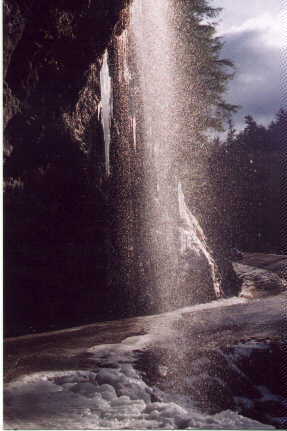 Traveling from Franklin towards Highlands, you will first pass the Cullasaja falls. You can pullover on the right, but be careful, please! As you continue east, you will reach the Dry Falls parking area in the Nantahala National Forest. It is maintained by the National Forestry Service. They charge a $2 maintenance fee that is well worth the price of admission and also valid for same day entry to Whitewater Falls (Just remember to save your receipt stub) There are steps that lead to a viewing area as well as a trail that allows you to walk behind the often thundering fall. Once again, if you are in the area, this is another must see attraction! A few miles up the road toward Highlands you can view Bridal Veil Falls, completing the tri-fecta of falls in the Cullasaja gorge. Recent storms have caused a rock slide, limiting your ability to drive under the cliff overhang. Nonetheless, still a beautiful sight.